The aim of this study was to assess the antimalarial activity of nine medicinal plants used by Karens of Andaman and Nicobar Islands, against Plasmodium falciparum chloroquine-sensitive MRC-2 isolate. The methanol extracts were obtained by cold percolation method and in vitro antimalarial activity was assessed using M-III method. The results indicated that out of nine plant species tested, four plants, viz., Z. spectabilis, S. wallichiana, C. pulcherrima and Amomum sp. demonstrated significant antimalarial activity (50% inhibitory concentration values were 5.5 ± 0.7, 12.0 ± 2.5, 14.6 ± 1.3 and 37.3 ± 2.5 ?g/mL respectively) with no toxicity effect on erythrocytes. Chander MP, Kartick C, Vijayachari P. Ethnomedicinal knowledge among Karens of Andaman & Nicobar Islands, India. J Ethnopharmacol. 2015; 162: 127-33. Dubar F, Egan TJ, Pradines B, Kuter D, Ncokazi KK, Forge D, Paul JF, Pierrot C, Kalamou H, Khalife J, Buisine E, Rogier C, Vezin H, Forfar I, Slomianny C, Trivelli X, Kapishnikov S, Leiserowitz L, Dive D, Biot C. The antimalarial ferroquine: Role of the metal and intramolecular hydrogen bond in activity and resistance. ACS Chem Biol. 2011; 6: 275-87. Krishnamoorthy K, Purushothaman J, Natarajan R, Shriram AN, Pradeep KD, Sehgal SC. Altered environment and risk of malaria outbreak in South Andaman, Andaman & Nicobar Islands, India affected by tsunami disaster. Malaria J. 2005; 4: 32. Lopez ML, Vommaro R, Zalis M, De Souza W, Blair S, Segura C. Induction of cell death on Plasmodium falcciparum asexual blood stages by Solanum nudum steriods. Parasitol Int. 2010; 59: 217-25. Mallikharjuna PB, Seetharam YN, Radhamma MN. Phytochemical and antimicrobial studies of Strychnos wallichiana Steud Ex DC. J Phytol. 2010; 2: 2227. Manimunda SP, Sugunan AP, Sha WA, Singh SS, Shriram AN, Vijayachari P. Tsunami, post-tsunami malaria situation in Nancowry group of islands, Nicobar district, Andaman and Nicobar Islands. Indian J Med Res. 2011; 133: 76-82. Oberoi CP. Eco-tourism paradise: Andaman and Nicobar Islands. Delhi, B.R. Publishing Corporation, 2000. Parzy D, Doerig C, Pradines B, Rico A, Fusai T, Doury JC. Proguanil resistance in Plasmodium falciparum African isolates: Assessment by mutation-specific polymerase chain reaction and in vitro susceptibility testing. Am J Trop Med Hyg. 1997; 57: 64650. Rasoanaivo P, Ratsimamanga US, Ramanitrhasimbola D, Rafatro H, Rakoto RA. Criblage d? extraits de plantes de madagascar pour recherche d? activite antipaludique et d? effet potentialisateur de la chlorquine. J Ethnopharmcol. 1992; 64: 117-26. Sivasothyu Y, Awangu K, Ibrahim H, Thong KL, Fitrah N, Koh XP Tan LK. Chemical composition and antibacterial activities of essential oils from Zingiber spectabile Griff.J Essential Oil Res. 2012; 24: 305-13. Trager W, Jensen JB. Human malaria parasites in continuous culture. Science 1976; 193: 67375. Vivek MN, Sachidananda Swamy HC, Manasa M, Pallavi S, Yashoda K, Asha MM, Chaithra M, PrashithKekuda TR, Mallikarjun N, Onkarappa R. Antimicrobial and antioxidant activity of leaf and flower extract of Caesalpinia pulcherrima, Delonix regia and Peltaphorum ferrugineum. J Appl Pharma Sci. 2013; 3: 64-71.
WHO. WHO/CTD/MAL/97 20 Rev 2, Geneva, 2001. Chander, M., C. R. Pillai, and P. Vijayachari. “Antimalarial Efficacy of Nine Medicinal Plants Traditionally Used by the Karens of Andaman and Nicobar Islands, India”. 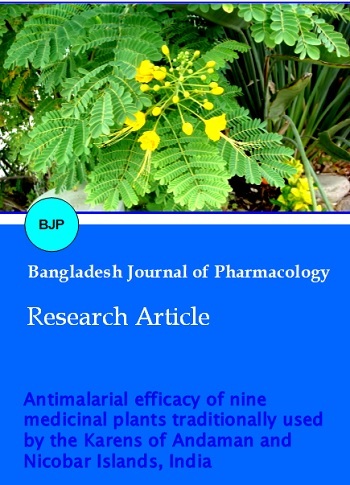 Bangladesh Journal of Pharmacology, Vol. 11, no. 1, Dec. 2015, pp. 126-9, doi:10.3329/bjp.v11i1.24055.